Something is wrong in the world of psychiatry. 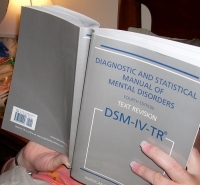 It’s not just that the new edition of the medical profession’s Bible, the DSM 5, was originally due to be released in 2012, but has now been delayed to 2013. It’s that the whole reason a new DSM is deemed necessary is that we’ve made recent advances in neuroscience, molecular biology, and brain imagining. You CAN’T have a diagnostic manual that doesn’t represent brain imaging! The trouble with this rational is: there is not a single biological test that will be included in the diagnostic criteria sets of the DSM-V. So we need a manual about mental illness that includes our knowledge of biology and neuroscience, but we’re not actually going to include these things in the final result. It seems the methodology of the psychiatric Bible is not as seamless as its proponents would like us to believe. This concerns the public, and it should: proposed changes to the DSM 5 can affect every area of your life, including sexuality, anxiety, childhood, and eating. The American Psychiatric Association has a history of classifying things like “homosexuality” as mental illnesses. That was later removed, but you can still be deemed mentally ill if you’re shy, or if you’re outgoing, or if you’re not ambitious, or if you’re too ambitious, or if you love your parents, or if you don’t. Yes, something is wrong in the world of psychiatry. Frances has criticized the upcoming publication of the DSM-V for its secrecy, its advancement in nomenclature and the authors intended “paradigm shift” without the fundamental and explanatory understanding of biological or psychosocial causation. Without this understanding, the question begs itself—is all the labeling and taxonomy of the DSM helpful or necessary? Especially without any actually diagnostic criteria coming out of the science it purports to utilize? And, so, as mental health professionals and clients to those services, we must ask ourselves: Are we simply diagnosing problems with living when little etiological evidence exists? And, more pointedly, could it be that we are all searching for purpose, meaning and ways to self-actualization—and in the meantime—experiencing suffering along the way? Stay tuned, there is no end in sight to the label-philia of the DSM.